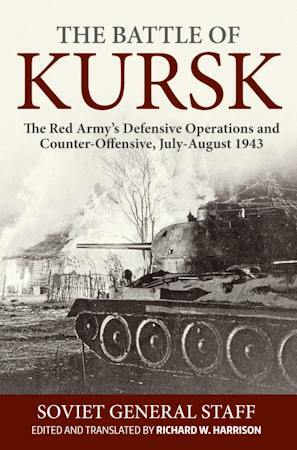 The Battle of Kursk: The Red Army s Defensive Operations and Counter- Offensive, July - August 1943, offers a peculiarly Soviet view of one of the Second World War s most critical events. While the Germans defeats at Moscow and Stalingrad showed that Hitler could not win the war in the East, the outcome of Kursk demonstrated beyond a doubt that he would lose it. This study was compiled by the Red Army General Staff s military-historical directorate, which was charged with collecting and analyzing the war s experience, and issued as an internal document in 1946-47. The study languished for more than a half-century, before being published in Russia in 2006, although heavily supplemented by commentary and other information not contained in the original. The present work omits these additions, while supplying its own commentary in places deemed necessary. The book is divided into two parts, dealing with the defensive and offensive phases of the battle, respectively. The first begins with a strategic overview of the situation along the Eastern Front by the spring and summer of 1943 and the Soviet decision to stand on the defensive. This is followed by a detailed examination of the Central Front s efforts to counter the expected German attack out of the Orel salient, and the Voronezh Front s attempts to do the same against the German concentrations in the Belgorod-Khar kov area. The rest of this section is devoted to an exceedingly detailed day-by-day, tactical-operational account of the struggle, particularly along the southern face of the salient, where the Germans came closest to succeeding. The second part will be more of a revelation to the Western reader, who is likely to be more familiar with the defensive phase of the battle. Here the authors once again, in great detail, lay out the Red Army s preparations for and conduct of a massive counteroffensive to clear the Orel salient, which soon degenerated to a grinding struggle, which while ultimately successful, cost the Soviets dearly. Likewise, the authors detail the Voronezh Front s preparations to reduce the Belgorod salient and seize the industrial center of Khar kov. This offensive, in conjunction with a simultaneous offensive in the Donets industrial region, pushed the German lines to the breaking point and set the stage for the follow-on advance to the Dnepr River and the eventual liberation of Ukraine. Includes 6 maps.